There's no way around it - retail in 2018 and beyond includes having a shoppable website. Consumers today are spending more and more time browsing a store’s website before they come into the store to make a purchase. Creating a best-in-class website can seem daunting. There are things to figure out like how much to invest and how to build the best possible experience. But did you know that your website could become cost-neutral, better yet, a revenue-generating line of business? At SmartEtailing, we've developed a website platform that allows a bike shop to have a top-of-the line e-commerce platform, purpose-built for the bike industry. With features like a simple, easy to use website builder, POS integrations, and a fully shoppable catalog, we have the right solution for any independent bike retailer. Websites can be a cost-neutral or revenue-generating piece of your business. By focusing on a few key areas, every retailer that uses our technology can create and maintain a website that pays for itself. Proper website maintenance, email marketing strategy, and in-store promotions can put you on the path to online success. A simple, yet valuable task is maintaining your website. This includes making sure your business name, address, and phone number are accurate. Keeping you store hours current with holiday and seasonal changes is also a must. Merchandise your homepage with current and relevant content that will give value to potential customers by pointing them to the right products. Having a graphic up for a sale that has been over for 3 months is a red flag to visitors that you're not involved with your website, which can ripple into distrust of your physical store as well. Likewise, not putting your featured products on the homepage is like keeping them in the back room of your shop. Sure, people will find them if they ask, but why not put them right up front when they walk in? Providing a good experience for customers who visit your site helps bring people in the front door and increases overall revenue. Like your website, you have full control over your email list. Emails are not subject to algorithms or paid placement. It's your ticket to your customers' inboxes. To make the most of this interaction, keep the following in mind to drive traffic to your site and sales to your store. Keep your list clean - Make sure your list is up to date and that any duplicate or inactive emails are removed from your list. This will reduce your email bounce rates and keep your emails going to the right people. Stay focused - We receive an average of 121 emails a day. With that much going on, keeping your email messaging focused insures that you get your customers attention. Having too many competing messages in an email that's already competing with 100 other messages is a recipe for email failure. Be consistent - A major key to effective email marketing is frequency. Staying consistent lets people know that you're active and to expect to see your emails often. We suggest that you send out emails at least twice a month. As you venture out, keep track of the engagement of your customers and change your frequency accordingly. These three things will keep your email marketing focused and valuable to your customers while increasing the return on your marketing investment. Don't forget the value of letting your customers know about your site in your physical store. Letting them know that there is a place for them to shop when the doors are closed turns your website into a helpful salesperson that’s ready whenever they are. One way to do this is to mention it when interacting with customers, either while they are browsing or during the sales process. You could even use POP signage on end caps or windows to promote your website as a convenient way to shop your inventory. A new trend that is cropping up in retail is "click and collect." This allows customers to order items online, at their convenience, for pick up in store. Industries as varied as fast food and electronics are seeing this as a valuable use of resources and have seen increased customer interaction. When you promote "click and collect" to your customers, your website isn't just for marketing, it's actually closing sales for you. 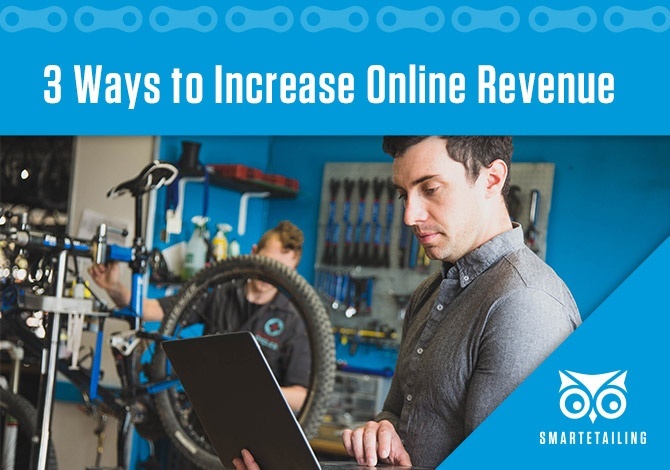 With these three strategies, you can more effectively attract visitors and close sales, both on your website and in your store. This not only creates enough revenue for the website to pay for itself but increases your bottom line in a volatile retail market. If you not sure where to begin, contact us today to learn more about our website packages or our marketing services. Our in-house marketing agency is filled with people who are passionate about the bike industry and are skilled in marketing. They can help you with all three strategies above or with other projects like custom website builds and direct mail.